Hey guys! I’m on Day 3 of my New York City vacation and by this time, I have already opened up stock in Wafels & Dinges, have begged a doorman on Fifth Avenue to let me please live there and have been kicked out of Bergdorf Goodman for crying into an Oscar de la Renta couture gown because it’s so beautiful and because I’m so poor. So I’d say this vacation is off to a great start! Today, I am super excited to introduce you to my new friend Lindsey from American Heritage Cooking! Even if Lindsey and I have just met, I feel like I’ve known her forever. She’s super sweet, a baking genius and is basically my sista from another mista. I mean, how could you not love these Salted Caramel Butter Bars (butter.bars, people) or these Triple Cinnamon Cupcakes?! I’m positively enamored with her easy, accessible recipes, genius flavor combinations and gorgeous photography — and I know you will be, too! So without further adieu, here’s Lindsey with these earth-shatteringly AWESOME cookies! Hey! I’m Lindsey from American Heritage Cooking and I’m super excited to be guest posting for Hayley today! Because she’s, like, the coolest! She also, because being the coolest isn’t enough for her, bakes up some genius inspired treats. So obviously I’m beyond flattered that she asked me to guest post while she lives it up in NYC! 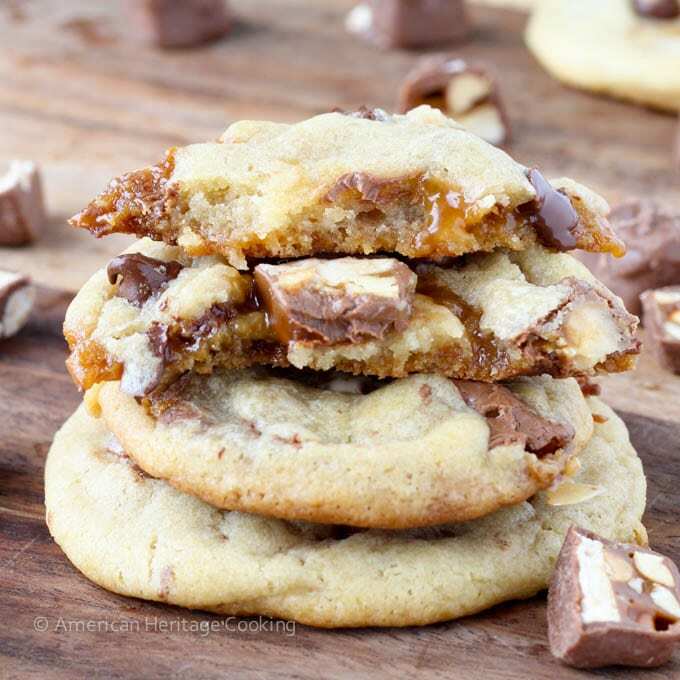 What better to make than Caramel Stuffed Brown Butter Snickers Chocolate Chip Cookies?! I am fully aware that this name of these cookies is on the verge of ridiculous. 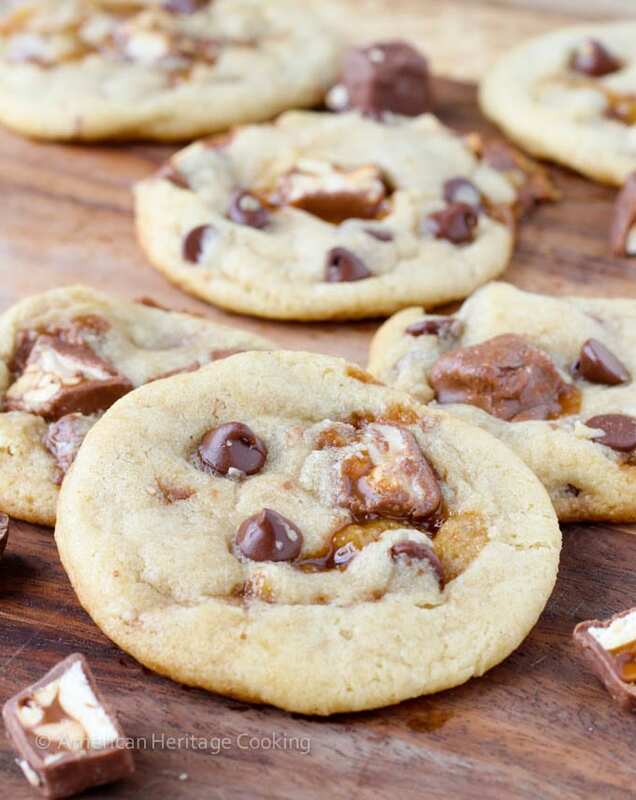 Maybe I should I have just called them something completely different like Magic Stuffed Cookies, because I’m pretty sure that if magic existed, it would take the form of caramel and snickers and chocolate chip cookies. And it would definitely have to have brown butter. And probably funfetti for Hayley. I used homemade caramel but you could keep it simple and put half a caramel candy in each one. These cookies are a modification of my latest favorite cream cheese chocolate chip cookie. Whoever said you don’t mess with perfection was just plain wrong. They aren’t the prettiest of cookies but after one bite no one will care. 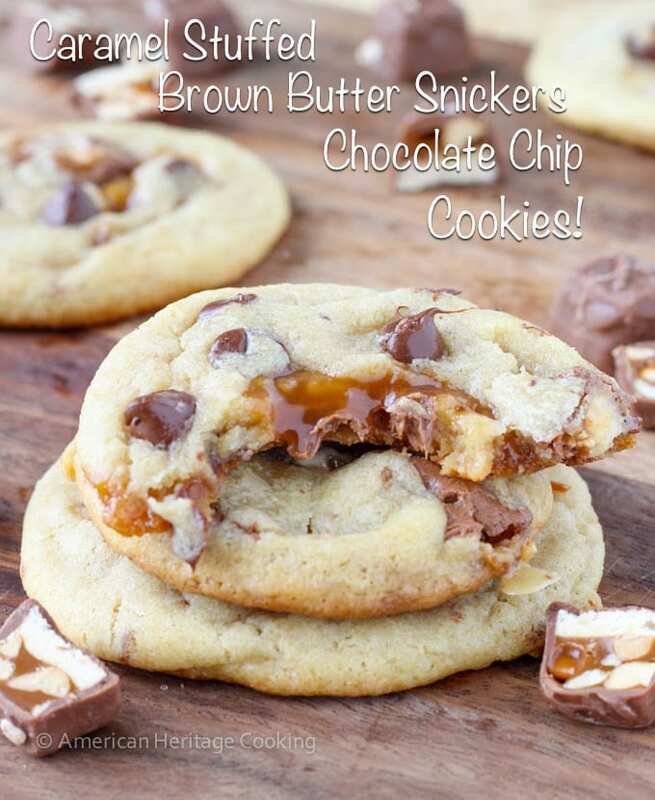 The caramel melts in the oven and spreads throughout the cookie, so that you get a little caramel, a little Snickers and a little chocolate in each bite. Messy, gooey, awesomeness! 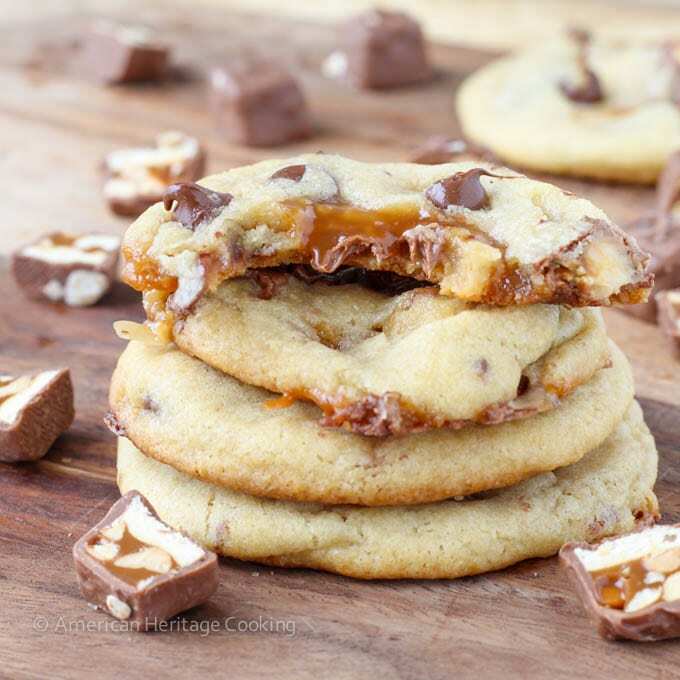 These ooey, gooey, caramel-packed cookies from Lindsey at American Heritage Cooking are the EPITOME of decadent! You won't be able to stop at one! In a large bowl combine flours, baking soda, baking powder, cornstarch, and salt. Whisk together and set aside. Combine butter and sugars in the bowl of a stand mixer and beat until creamy and lighter, 3-4 minutes. Add the eggs one at a time, beating between each addition. Add the vanilla with the second egg. Be sure to scrape down the sides of the bowl as necessary. Reduce the mixer speed to low and gradually add the flour mixture. I usually do 4-5 additions, scraping down the bowl as necessary. Make sure you add the next addition as soon as most of the flour has been incorporated from the last one. Refrigerate overnight. I know, I know. Patience grasshopper. The melted butter makes this step critical. Preheat oven to 350° and line several baking sheets with parchment or silpat. Roll dough into balls approximately the size of a golf ball. Divide each ball in half and make a little indent with your finger. Either spoon caramel sauce in the indent or press half of a caramel candy. Put the two halves back together and gently press down the sides to reform a ball. Place on a cookie sheet 2 inches apart and bake for 10-12 minutes or until the sides begin to brown and the edges are set. The centers will still look underdone. Let cool 5 minutes on the baking sheet and then remove to a wire rack to cool completely. 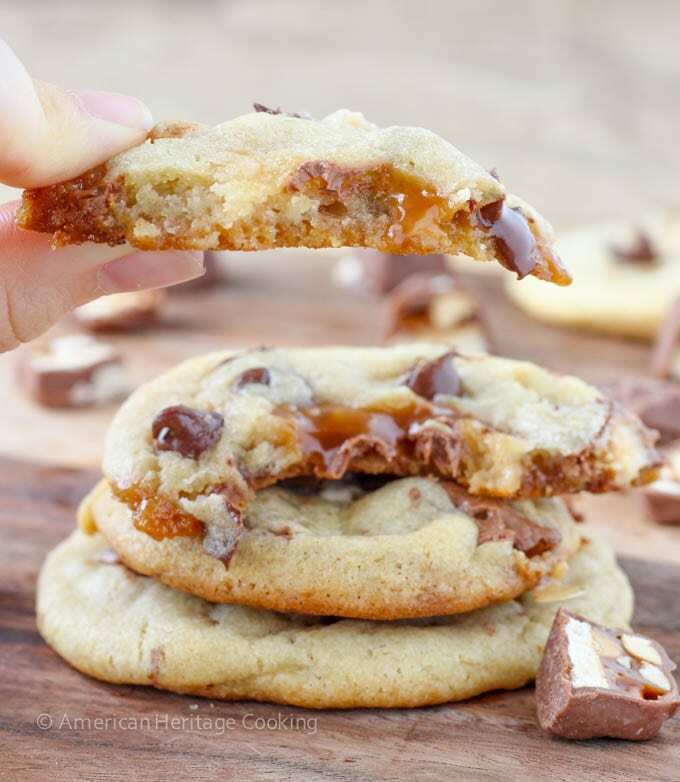 If you are impatient and you eat a cookie too soon, it will seem way underdone and the caramel may still be hot and oozy. Don’t those cookies look AMAZING?! Be sure to connect with Lindsey on her blog, American Heritage Cooking, as well as FACEBOOK, TWITTER, PINTEREST & INSTAGRAM for more incredible recipes! Thanks again, Lindsey — you rock! Aww thanks, Hayley! You are the best! Based on your IG feed, I know you are having a fabulous time and I am insanely jealous of all the macarons and waffles and general NYC awesomeness! YAY YAY YAYYYYYYY!!!!! I love both of you girlies!!! And omigerd these coooooookies. The caramel deliciousness is ON HIGH! I don’t see where to add the cream cheese….?? When do you add the cream cheese? Did I miss that in the directions? Will try adding after the butter/sugars are creamed. Sound yummy, hope it works! I’m making these now and seem to be missing where the cream cheese goes. Oh! Looking back at the original chocolate chip cream cheese cookie recipe it goes with the butter and sugars. I already added the eggs so I guess we’ll see how it works! Hello! Lindsey was right about the awesomeness of your blog. Even after just a quick browse, everything looks beautiful. I’m not in NY with you, and I’m not eating these cookies right now. So basically, I’m failing. Aggghhh! These look SO good!